During cryogenic testing, the mirrors will be subjected to temperatures dipping to -415 degrees Fahrenheit, permitting engineers to measure in extreme detail how the shape of each mirror changes as it cools. NASA isputting the mirrors for its ambitious new James Webb Space Telescopethroughthe ultimate cold test ? one that exposes them to temperatures hundredsofdegrees below freezing to make sure they will work in space. Six of thespace telescope's big beryllium mirrors weresubjected to temperatures as low as minus 415 degrees Fahrenheit (minus248 Celsius) so engineers could measure in extreme detail how theirshape deformed as they cooled. NASA'sJamesWebb Space Telescope is slated to launch in 2014 to beginscanning theuniverse in the infrared range of the light spectrum to peer fartherback intothe universe's history than ever before. The telescope'smission is expectedto cost about $5 billion. But first,its vital mirror system must pass their endurance trials. Theultra-cold tests are being performed at the X-ray & CryogenicFacility atNASA's Marshall Space Flight Center in Huntsville, Ala. The building isthelargest X-ray facility to test bigspace telescopes. Theseexperiments tell scientists how well each mirror handles changes intemperatureover a range of environments in space, NASA officials said in astatement. The deepcold required by the space telescope's mirror system is around minus379degrees F (minus 228 Celsius), NASA said in a statement. Inside theoperatingtelescope, the mirrors must be cooled to extremely low temperatures inorder togenerate a high sensitivity to faint infrared light. Otherwise, distantgalaxies would be lost in the infrared glow created by the mirrorsthemselves. 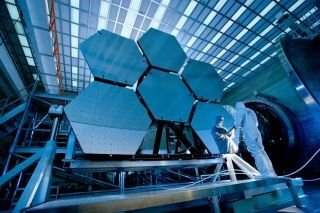 Ultimately,the James Webb Space Telescope will use a set of 18 connected mirrorsto detectinfrared light from space. The next set of telescope mirrors areexpected to arriveat the testing site in August.